When we planned our second gender reveal party we decided it would be good to include a few games again - just because not everyone knew each other, and games make everything more fun right? Right. We like to include games at parties in our family. I came up with a few games for our first gender reveal, but I wanted to come up with some new ones for this party. Here are the new games we came up with! It's a lot easier to make any game fit in with your gender reveal party if you make the games about "Team Boy" vs. "Team Girl". We had everyone pin on a bow or tie depending on what their guess was on the gender of our baby, and then teams were then formed! I found a list of Old Wive's Tales that had to do with the gender of the baby, and I turned them into a quiz. Then I printed up multiple copies and had all the guests take the quiz testing their knowledge on the Old Wives' Tales! If you would like to use the old wives' tale quiz I created, you can click the link above to view and print the document! If you use my quiz and write a blog about your party, please make sure to link back here! And leave a comment too because I'd love to check out your post. Thank you! "You are having a boy if your cravings are . . . This pregnancy: Callie has been craving both." It doesn't give away the answer, it just tells how I fit into the Old Wive's Tales on gender (and my pregnancies didn't necessarily fit nicely with all the Old Wive's tales, so it could also add an extra challenge in that way). I think it was fun for everyone to be able to check the sheet on my pregnancy, not only for the quiz, but also to give them clues when they were guessing the gender (though I think most of the guests came with their guess already in mind)! My mom won the Old Wive's Tale quiz, and I made sure to have a prize ready - games are just more fun if there are prizes. I kept it simple this time and just did a gift bag with Sugar Babies and Yankee votive candles in the "Soft Blanket" and "Vanilla Cupcake" scents (which I thought fit nicely with the baby theme). If a guy won I just told him to give the candles to his wife/mother! Last time we did Starbucks gift cards for five dollars as prizes, which were a big hit as well, so you can just pick any prize that you think people would like and that fits into your budget! We did a group quiz as well, and I did a little research on baby stats and made a quiz on them - ex. What is the most popular month/day of the week for babies to be born, states with highest and lowest birth rates, when someone may be more/less likely to have a boy/girl etc. If you are interested in seeing the questions I used, you can click the link below to view and download the quiz! If you print this for a party just print it in black and white so the answers don't show! However, please note that these questions are based on the statistics in the year 2012 - by the year 2013 the statistics I used to create this quiz will no longer be accurate. But you can get ideas from my quiz on how to form your own questions with currents stats. We had the teams split up into "Team Boy" and "Team Girl" again and fill out the quiz as a team. Then I told the answers and the team with the most right answers won! We actually had a tie, so we had to flip a coin and Team Blue won the coin toss. I think it's nice to include a little prize for these group games too, just to make it more fun, so we bought a big bag of mini candy bars and handed them out as prizes. Like I said earlier, you can almost make anything a game if you go the "Team Boy vs. Team Girl" route. We wanted to include a game that was a little more active and that the men would like, so my husband hung a tire on one of the trees out front, and we had a football/baseball throwing competition! We gave each person three throws, and then we kept score for Team Girl and Team Boy. You could also make this game a bit more casual and just let people mingle and do their three throws throughout the party. If the teams are uneven (and they probably will be), you can either have each team pick three players to compete, or you can let everyone throw and then divide the total points by the number of team members and declare the team with the best average score as the winners! We gave everyone on the winning team mini candy bars again as a prize to make it a bit more fun. For the big reveal we decided to do a scavenger hunt, so it added another game for our party! I grabbed a book of nursery rhymes and turned them into "clues" for different hiding places around our house. I tried to emphasize the key phrases in the nursery rhymes by making the words bigger or a different color. This led the guests to our water spigot at the back of our house - we tucked the envelope behind a pipe on the side of our house right next to the faucet! For this clue we hid the envelope literally "on the wall" by tacking it up on the wall behind the towels in our bathroom. This ended up being one of the hardest envelopes for the guests to find! I was originally just going to stick the envelope in the oven for this clue and make it easy, but since we were using the oven to keep some of the food warm I ended up hiding it in the drawer underneath the oven instead, which made it a little harder. We tacked the next envelope onto one of the trees on our property! This one could have been really hard if we wanted it to be, since we have a ton of trees around our house, but we set boundaries for the clues to make it a little easier. This final clue led to a package that held the answer as to whether we were having a boy or a girl! We hid the package in our wood stack! The person who found the package was given a prize (the same gift bag that I mentioned earlier), and we also let him open the package to reveal it to everyone! We did this last time too, but I thought I'd include it in this post as well. We decided to give everyone a prize for guessing the right gender, so in that way guessing correctly became a sort of game! We bought full-sized candy bars and made sure we'd have enough in case the teams were split unevenly (which they were - a good 75% of our guests thought we were having a girl). I think it makes it more fun to come to a gender reveal if there is a little reward for guessing the right gender! And those are the games we played at our second gender reveal party! All the games turned out well, and everyone seemed to have fun with them - which is really the point in including games in the first place! 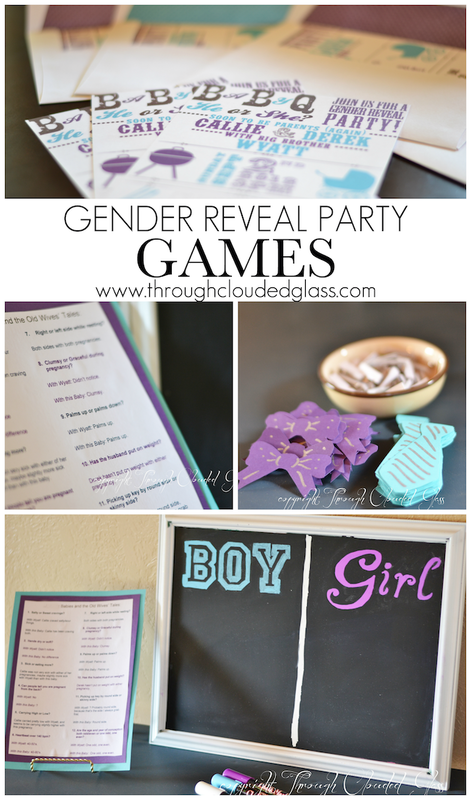 If you want to see more gender reveal party game ideas, check out the games we did for our first gender reveal party as well! I love how you made up the clues for the scavenger hunt using nursery rhymes and adorable fonts! You're making me really want to have a gender-reveal party the next time around! Wow Callie you went all out! It sounds like it was so much fun. :) I'm impressed! I just love the scavenger hunt idea and how you did nursery rhymes for the clues..so cute!!!! For the answer quiz...You colored both answers so I am confused as to which answer is correct or not. Could you please let me know if the blue is correct, or the purple? Blue answers are correct, red are incorrect. I think the colors show up weird sometimes because I created the document in Pages - I don't know if you are viewing it on a Mac or not. I love your ideas! Thanks for sharing! Where did you get those cute bow and tie pins? This is perfect! I have been looking for games to play for while. Thanks for posting this. How do I read the answer key for the Wive's Tale Quiz? I'll be linking to your blog when I post about my gender reveal party. Can you email me the document on the Old Wives Tale quiz? Also, Can I see your answers to the quiz? I wasn't sure how to go about asking the "mom to be" to answer them. These are soo awesome. I love the scavenger hunt!! Thanks for sharing!!!!! So, I really want to try the scavenger hunt, but I've actually never participated in one. So, I don't know how it works. Could you explain how you started it off? How did you lead them to the first clue (the jack and Jill card)? If I remember right, I just handed out the first clue, which led to another clue, that led to another clue, etc! On A Fall Day 11 Years Ago . . .
22 Weeks With Our Baby Girl! Our Second Gender Reveal Party!